I love summer, it is my favorite time of the year. Even though the days seem longer, time seems to slip by too quickly. During the summer months, I put so many things on my to-do list, I tend to burn myself out. A recent, nasty cold that brought me to my knees, reminded me that you should always take time to slow down and make time to enjoy thy nature that surrounds you. 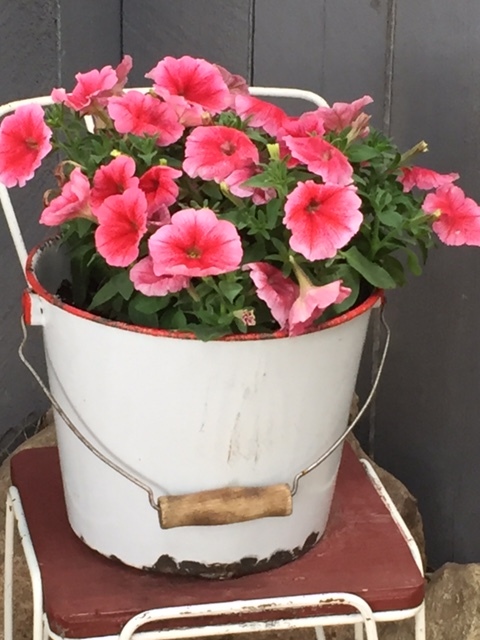 Sometimes the simplest things (like an old bucket filled with flowers) can lift your mood, make you appreciate the beauty that surrounds you and even lower your stress levels. The universe, by way of sending me this cold, guided me to take time to stop and really “see” the beauty in all that surrounds me, like this vintage lawn chair perched near an apple tree (inviting me to sit and relax )and this old grain elevator, both of these items have stood the test of time. Being outdoors gives us energy, makes us happier, helps us to relieve the everyday stresses of our over scheduled lives, opens the door to creativity, and helps us to be kind to others. I am always drawn to antique, vintage and unusual items, especially w hen they are displayed in nature. Is it the greenery, quiet, sunniness, loamy smells, all of those, or something else that lifts our moods and makes us feel better? Have you taken time lately to stop and enjoy thy nature? This entry was posted in Decorate and tagged antique, apple, apple tree, art, bucket, Decorate, DIY, flower, flowers, garden, garden art, grain, grain elevator, lawn chair, nature, repurpose, reuse, rustic, vintage. Bookmark the permalink. Great post and so true. We seem like we are always in a rush to get to the next thing not appreciating what is in front of us right now. Love the pictures of vintage items used in creative ways.